60ºF…. 62ºF yesterday. Snow predicted after midnight and rainy and in the 30’s tomorrow and Wednesday. Bet that 60º mark is stuck in your head though. It is in mine. All I want to do is ignore work and work on my tan. Alas, that cannot be. So I’ll console myself with a deviation from my standard dress code. Tan gabardines and a blue blazer on a Monday! And if I’m really feeling daring, I will reach for a printed tie. A touch of whimsey. Tortoises and Hares, perhaps. Or colourful horsebits. 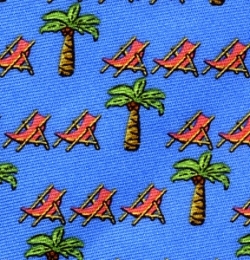 Or I may work on my tan vicariously through my tie… and choose a palm tree and beach chair motif. The king of all whimsical ties is made by Hermès. Each twill tie with an inspired animal print is produced in a new colourway — colours are never repeated and designs are retired (although five designs a season may reappear in new colours.) The colourful little characters are a new line for a very old business. While Hermès began selling ties in the Monte Carlo boutique in the 1950’s (in order for a tieless gambler to meet the strict dress code at the tables… what a nice thought…. ), the whimsical animals didn’t make their appearance until the 1980’s. Before that it was geometrics, tackle and horsebits, and of course grouse and other game birds. The foulards were an instant hit and fast became a classic. From a distance they read as geometric prints. Up close they read Chairman of the Board, although the greenest hire would be quite correct in wearing his the first day on the job. That qualifies them as very easy and elegant additions to the wardrobe. Let the buyer beware.. there are many imitators (like the marvelous Peter-Blair number at the head of this post) and storied companies who produce the ties, but there are even more fakes. Fortunately, Hermès has a fun and easy to use online presence (click the photo to go…) and there are reputable dealers out there for those of you who are feeling a little spring in your step even in these perilous economic times. This entry was posted in Elegantology and tagged Ferragamo, Hermès, neckwear, Peter Blair, ties, whimsical designs. Bookmark the permalink. I will always remember the first Hermes tie I bought, a purple and blue geometric print, at Neiman Marcus in Boston while on a business trip as a junior banker in my mid twenties. I was very excited to have it and thought it quite glamorous and a sophisticated and worldly departure from the wool foulard JPress and Brooks ties that my father always wore. Came a time that I had built up such a collection of Hermes ties (the more whimsical the better) that I could wear a different one each day of the week for at least a month or two without repeating. Then came “casual” friday, followed by “business casual” every day of the week except for client meetings when I (still) put on the full banker’s gear. So I may be put on one of my Hermes tie these days only once or twice a week. 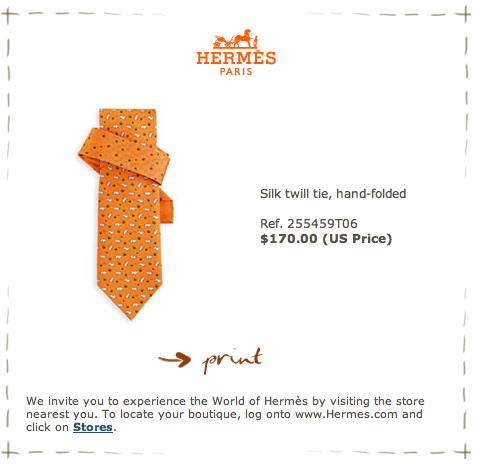 With so many Hermes ties in my closet to choose from, and with such little wear and tear to them these days I haven’t bought a new one in more than three years (and at these prices – and in this economy – I won’t be buying another new one any time soon). On a happier note, while I no longer require a tie most days in the office, I’ve started to wear one (with a jacket) every now and then on weekends in the country, but not my Hermes ones as they are too “city”. I enjoy holding up some semblance of dress, and the reaction it provokes when out an about (including during the day) is often quite amusing (“Do you work here?”). My husband sported an Hermes tie today, one that I had given him several years ago – birds and bird houses, perhaps Spring is on his mind – on yet another snowy day. I adore the Hermes ties, scarves and of course the coveted Kelly Bag.